It’s the last week of May, which has always been the unofficial start of my summer. And I always like to start the summer season with a rewatch of one of the greatest movies ever made. After all, what better way to welcome the summer blockbuster season than with the film that is responsible for all of them? Steven Spielberg is responsible for several of the most memorable films of the last fifty years, but perhaps none has latched itself into collective conscience more securely than Jaws. Based on novelist Peter Benchley’s thriller of the same name, the writer and studio worked together to make sure the book created hype for the movie, and hired a mostly unknown Spielberg to direct. Despite a highly troubled production that went over budget and over schedule, an aggressive and innovative marketing campaign piqued audience interest and they responded with their wallets. Commercially, Jaws was an almost incomprehensible success, topping the all-time box office until Star Wars two years later. Adjusted for inflation, the film made over $2 billion in ticket sales. Critically, the film also did very well for itself as most appreciated Spielberg’s talent. It’s iconic poster, John Williams’ heart pounding theme and the line “You’re gonna need a bigger boat” are all known even if you haven’t watched the movie. But it’s also one of those rare legendary movies that pretty much live up to the legend. Jaws is the prototypical high concept movie; a film where the basic appeal is simple and compelling. There’s a giant man-eating shark terrorizing a coastal town and something has to be done about it. It’s easy to market, but it could easily have been a low budget, 90-minute cheesefest. 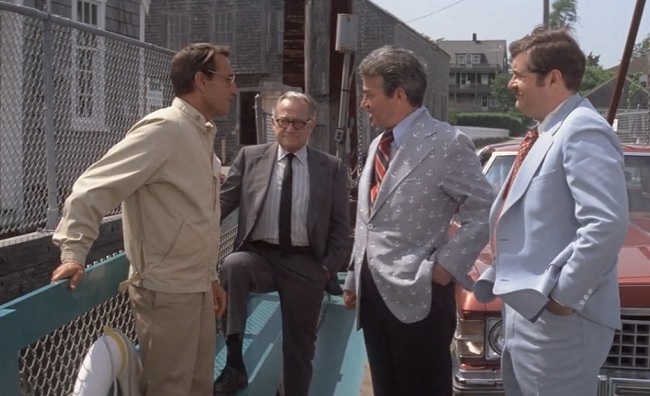 What makes Jaws stand out is that there it is actually a drama about human characters. We don’t see the shark until halfway through the movie, and it isn’t until the last half-hour that our heroes really start fighting it directly. Most of the movie is just interesting people having compelling conversation about a high stakes situation. The main conflict of the first half of the movie is between Chief Martin Brody and Mayor Larry Vaughan. Brody wants to close off Amnesty Bay’s oceans until the shark problem is addressed, but Vaughan isn’t going to let Brody cut off the income from tourists. Both men are concerned about their town, but one values safety and the other values the economy. These are important, and while the film plays the Mayor off as greedy, it also is quick to point out Brody’s somewhat irrational fear of the water. Either man could be right, right up to the wire. There’s a scene where children fake a shark attack to cast doubt on things… only for the very real shark to devour a child moments later. With this, the first conflict is resolved, and the more important one becomes the focus; how do they kill this massive, dangerous animal? The impatient viewer might wonder what the point of dragging out the reveal of the monster shark, but there are two clear advantages. One is that it allows Spielberg to ramp up suspense and keep us guessing about when the shark is attacking, just how big it is and whether it is killed or not. There are two lethal shark attacks before the Mayor does anything about it, only to jump to conclusions when a shark is killed and causing the death of another victim. There’s also a narrow escape involving a dock that shows the scale of the shark in a creative way. All of this allows for John Williams’ score and Spielberg’s adaptive filmmaking to suggest the shark in our minds, making Jaws a psychological thriller in the vein of Alfred Hitchcock. The more important function is we get time to learn about our heroes. Brody is the chief of police, and while he’s very good at keeping people safe on land, the sea is lawless and he fears it because of that. He’s also a family man who develops a sense of personal responsibility for the shark attacks because he couldn’t convince the mayor to close the beaches. We see a simple but powerful moment where he sees his son copying his hand movements and realizes that who he chooses to be is important for his children. This is a character who feels real, and has an arch over the film, and who is portrayed excellent by Roy Scheider. 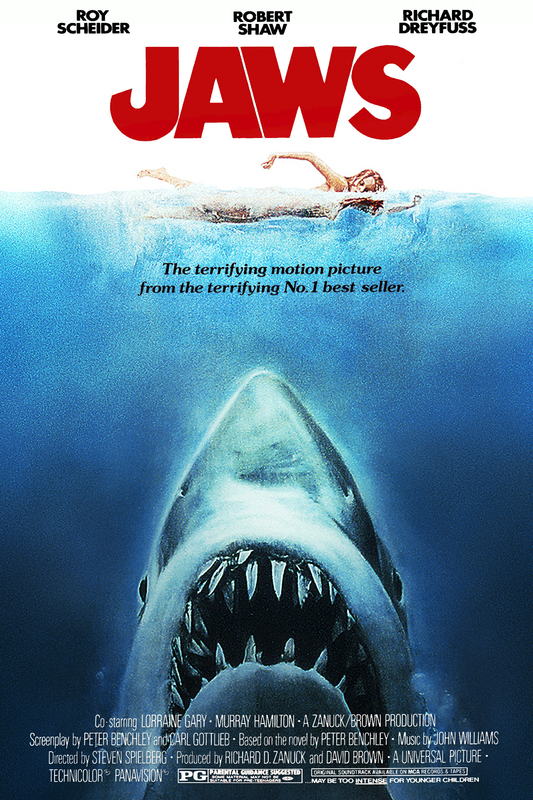 Having such a strong central character is important to any movie’s success, including movies about killer sharks. Brody may be the main character, but he has two very good supporting characters. Richard Dreyfuss brings humor and urgency to shark expert Matt Hooper, really making the most of a role that could have been really irritating with a less charismatic performer. He’s also a fun contrast with Brody because he fears the sea not because he is unfamiliar with it, but because he knows so much about sharks. That puts them at odds with the utterly fearless and enigmatic Quint, a shark hunter who only feels at home on the ocean. Quint is fascinating as a man who lives on the edge of death as much as he can because it’s the only way he can survive. Stage veteran Robert Shaw probably gives the most memorable performance, one that is largely improvised and feels authentic even though it’s over the top. The interplay between these three is fascinating and even when they start hunting the shark, their personalities are still driving the narrative. All of this was readily apparent on my first viewing when Michael Ornelas picked it for me a couple years back. What I’ve really come to appreciate on subsequent viewings is how cinematographer Bill Butler composes shots in interesting ways. Much of this film could have been shot at a TV level of cinematography, but instead we get interesting frames even in the most mundane settings. One of my favorite techniques is how natural barriers created by architecture are used within the frame to show divides in conversation. This isn’t an uncommon technique, but it’s used very well here. There’s also some truly great editing, including an iconic sequence where Butler uses passing bystanders as natural wipes, getting closer and closer to Brody before going into a dolly zoom when he sees the shark. Jaws is a great piece of filmmaking. It’s tempting to say that everything went wrong with this movie, and that’s why it turned out so good. The mechanical sharks were expensive and uncooperative, there were weather problems and local fisherman that made shooting schedules tight, and there were even casting issues. Spielberg’s entire future career was basically riding on this thing, and he somehow turned all these negatives into positives. Can’t get the shark to work? Get creative about suggesting the shark’s presence, ramping up the tension for one of cinema’s great slow burns. Can’t get big name actors? The shark is the star, and you get talented character actors who feel more relatable to the audience. But this section has never really been about the process of filmmaking, but rather about the finished product. Jaws is very nearly a perfect movie, one that holds up almost shockingly well more than forty years later. Amusingly, the only thing that doesn’t hold up is the shark itself. Once the thing shows up on screen and we realize just how fake it looks, some of the magic is gone. But by that point, most people are going to be wrapped in the story and buy into it on some level. Effects are often the first thing to age, but a well-told story will always compensate. Jaws is one of those rare movies that makes a huge impact immediately but also holds up well over time. The ripple effect of this film is still felt today with the summer blockbuster season, and it launched the career of Spielberg into the stratosphere. I don’t think Jaws is Spielberg’s best movie, but it may be the best example of what makes him a truly indispensable director. Lesser talents could not have worked around the problems with the mechanical shark, and those with less resolve wouldn’t have tried. With a world of pressure on him, Spielberg and his crew innovated and excelled. They crafted a masterful suspense movie that is a great film first, and great spectacle second. Jaws is one of the best movies ever made and deserving of its watershed status. I log reviews for every film I see, when I see them. You can see my main page here. Recent reviews include Annihilation, Red Sparrow and Solo: A Star Wars Story.